By all appearances, Kunjufu'bisi is nothing out of the ordinary. He's a lion of average size, but lanky in his build. The muscle he has is lean, rather than bulky, much like his father. Despite his lankiness, his features are delicate and rounded, eyes large set widely apart to give him something of a 'baby face' even though he appears to be fully grown. His coat coloration is that of corn, tinged with hints of gold. This coloration extends down his legs to his paws, though hindpaws have brown markings that circle his ankles. His eyes are hazel, predominantly dark brown, flicked with bits of amber and green. Underside and muzzle are slightly lighter than the rest of his pelt. His tailtuft is brown, matching the fur that forms a small, modest mane over most of his head and shoulders. The exception is the patch of silver that he inherited from his father, which inhabits the left side of his bangs. His ears are likewise tipped in silver around the upper edge. 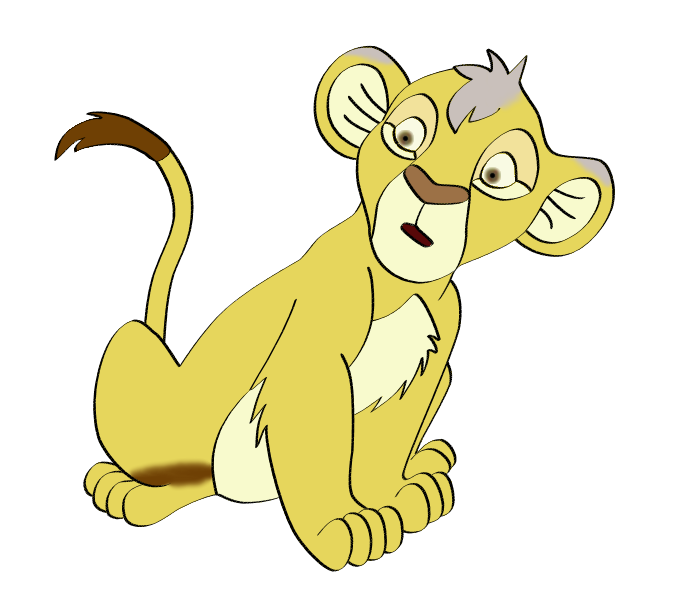 Kunjufu is a fairly easygoing lion. He's almost always grinning brightly at those around him and is hard to find in a bad mood. Despite his age, he still enjoys playing, often still behaving as if he's a cub. He quick to pick up on the feelings of others, focuing on individuals rather than his surroundings, preferring to spend time with others than go exploring. He seems to be a fairly sensitive individual who does what he can to appease his peers. Around the particularly strong-willed, he tends to show outright submission. Once forgiven, however, he seems quick to forgive in return. His main handicap seems to be his difficulty with sounds. He's never made a vocal sound in his life, though his hearing appears unaffected, and tones such as anger or playfulness seem to be detectable. By now he's recognized that there is something going on in the world around him that he's not a part of, and appears incapable of understanding speech. It doesn't seem to be adversely affecting his mood or causing him frustration. To cope, he's been seen using 'sign language' around others, mostly when it comes to giving 'names' to others. Kunjufu was born into the Kopje Valley pride to Mzuhali and Kesonam. He made friends with several of the youth around the valley and spent his days learning and playing, as most cubs do. On the cusp of adolescence, he went to the Celestial Volcano with the other youth to undergo training. Though not able to understand verbal communication, efforts were made to teach him in a manner that he understood. He was the first of his litter to venture out into the wider world. After encountering Dakarai on the edge of the volcano, the slightly older youth having indicated that he was making his way to somewhere on the horizon, Kunjufu decided to tag along. The two have made it to the Pride Lands in the company of a lioness, Mja, with Dakarai shielding his cousin from some of the harsher elements of the rogue lifestyle. As he was neared adulthood, Kunjufu ended up returning to the valley. Since then, he has lived a peaceful life among the pride, generally keeping out of the way. His passivity did not seem to suit the usual male role of a guard, so he's ended up in more of a scouting role. Kunjufu's silence is due to a condition known as aphasia, an acquired language disorder in which there is an impairment of any language modality which may include difficulty in producing or comprehending spoken or written language. His particular type is closest to global aphasia, causing him to have severe communication difficulties, and be extremely limited in his ability to speak or comprehend language. So far he has been totally nonverbal, and only uses facial expressions and gestures to communicate. It is likely due to his genetics rather than some sort of head trauma as a youth since he has been silent since birth. 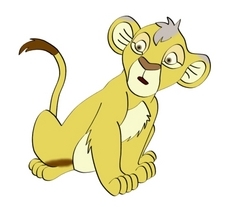 Kunjufu's picture is a recolored picture of Tama from a series of German TLK comics.